The snakkubus is a sort of minor goddess or demon that dwells in the Grimbog. She has the upper body of a woman, the lower body of a snake, and the upper body of a snake somewhere in-between the two. When disturbed, she typically attacks with the jaws of her midsection, the fangs of which carry a lethal poison. While there are varying reports of whether or not she is a single creature or a community, most adventurers agree that it’s unlikely an entire tribe could have such fantastic… eyes. 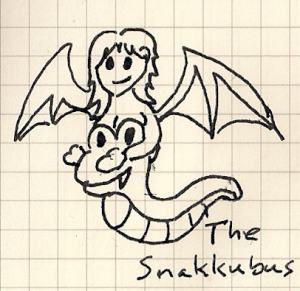 The snakkubus can take the form of a beautiful female human or elf, but doesn’t, because she has a positive body image. Slithering Slide: The snakkubus’ movement cannot be blocked by an adventurer. Poison: Any adventurer against whom the snakkubus rolled a critical hit during a fight must, at the end of the fight, take another attack from her, whether or not she still lives. ← Previous Previous post: Annie, Would I Lie to You?